Limb-girdle muscular dystrophy refers to a group of disorders that cause weakness and wasting of the muscles around the shoulders and hips. Muscle biopsy and genetic testing are the most important tools used in the diagnostic evaluation of patients in whom limb-girdle muscular dystrophy (LGMD) is suspected. Creatine kinase is also used for diagnosis because autosomal recessive LGMDs often cause extremely high CK levels. Magnetic resonance imaging (MRI) can help differentiate forms of LGMD. No specific treatment is available for any of the LGMD syndromes, though aggressive supportive care is essential to preserve muscle function, maximize functional ability, and prolong life expectancy. Aggressive use of passive stretching, bracing, and orthopedic procedures allow the patient to remain independent for as long as possible. Orthopedic surgery may be needed to help correct or prevent contractures and scoliosis. This classification allowed for a wide range of phenotypic variability. Improved diagnostic methods have demonstrated that a large group of neuromuscular disorders, including some that were not truly LGMD, were included in this definition. LGMD classification has been revolutionized with the advent of molecular genetics. The most common classification scheme is based on clinical and molecular characteristics. It divides cases into autosomal dominant (LGMD1) and autosomal recessive (LGMD2) syndromes. This list continues to expand, and, as of this writing, specific mutations listed on OMIM are known for 7 autosomal dominant LGMDs and 23 autosomal recessive LGMDs. Overlap exists with Congenital Muscular Dystrophy (CMD) as several gene mutations can cause both a LGMD and CMD phenotype. Although not truly limb-girdle syndromes, diseases classified as myofibrillar myopathies share several phenotypic characteristics with the LGMDs. They are usually adult-onset diseases with slowly progressive weakness involving proximal (and distal) muscles. Many patients have respiratory failure, cardiomyopathy, and neuropathy. Some mutations can cause both a myofibrillar myopathy and a muscular dystrophy phenotype. Cardinal morphologic features of myofibrillar myopathies on muscle biopsy are vacuolated muscle fibers and inclusions that were initially given different names in the 1970s. In 1980, desmin was noted to accumulate in the inclusions, and the name desmin storage myopathy was coined. However, in the mid 1990s, other proteins were also found to accumulate in the abnormal muscle fibers, and molecular genetic studies revealed several chromosomal loci. Since then, the relatively generic term myofibrillar myopathy has been adopted. These diseases are discussed here in part because mutations in 2 genes can present with either an LGMD or a myofibrillar myopathy phenotype. Limb-girdle muscular dystrophy (LGMD) protein defects occur in several pathways involved in the biologic function of muscle and can be divided into groups based on cellular localization. These include proteins associated with the sarcolemma (see image below), proteins associated with the contractile apparatus (see image below), and various enzymes involved in muscle function. However, although the primary defect in many LGMDs is known, the precise mechanism leading to the dystrophic phenotype has not always been elucidated. Specific protein function and abnormalities are discussed below with each LGMD. Schematic of the sarcomere with labeled molecular components that are known to cause limb-girdle muscular dystrophy or myofibrillar myopathy. 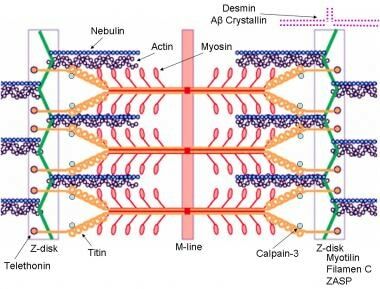 Mutations in actin and nebulin cause the congenital myopathy nemaline rod myopathy, and the mutations in myosin cause familial hypertrophic cardiomyopathy. Image courtesy of Dr F. Schoeni-Affoher, University of Friberg, Switzerland. The cause of myofibrillar myopathies is unknown but is discussed below for each of the different mutations that have been associated with the disease. Of interest, several mutations that result in myofibrillar myopathy are in genes that code for Z-disk proteins. Autosomal recessive LGMDs are more common than the autosomal dominant forms of the disease, which probably account for about 10% of all LGMDs. The overall frequency of all LGMD syndromes has been estimated to be 5-70 per 1 million population in several countries. Different populations often have different frequencies of the various LGMDs. Several studies throughout the world have estimated the frequency of LGMDs based on immunochemical and genetic testing. [3, 4, 5, 6, 7] In many studies, LGMD2A is the most common, accounting for 8-26% of all LGMDs. In some populations, it may be the only LGMD present (Reunion Island, Basque Country) with very high prevalence rates (48-69 cases per million). LGMD2B is also relatively common, accounting for 3-19% of all LGMDs. LGMD2I is common in certain parts of Northern Europe (Denmark and parts of England), but worldwide frequencies outside this area account for 3-8% of all LGMDs. The sarcoglycanopathies as a group (LGMD2C-LGMD2F) are a common cause of LGMDs, accounting for 3-18%, with a high percentage of severe cases. As with other LGMDs, different sarcoglycanopathies are overrepresented or underrepresented in different populations, with some populations having representative cases of all 4 sarcoglycanopathies and other populations having only 1 mutation type, which is probably related to founder effects and population inbreeding (consanguinity). LGMD2C is common in Tunisia; LGMD2D is common in Europe, the United States, and Brazil; and LGMD2E and LGMD2F are common in Brazil. Overall, LGMD2D (α-sarcoglycanopathy) is twice as common as LGMD2C (γ-sarcoglycanopathy) and LGMD2E (β-sarcoglycanopathy), and LGMD2F (δ-sarcoglycanopathy) is the rarest. All the congenital muscular dystrophies can present with a LGMD phenotype, and OMIM recognizes 4 at this time (LGMD2I, LGMD2K, LGMD2M, LGMD2N). Morbidity and mortality rates vary. With early onset, the course is generally rapid. Patients can become wheelchair bound in their early teens and die from respiratory complications in their late teens. Patients with slowly progressive LGMD may be able to ambulate for more than 30 years after disease onset, and they may not become wheelchair bound until much later than their teens. Some patients with confirmed mutations have had nearly normal strength. LGMD is reported in races and countries throughout the world. Autosomal dominant and autosomal recessive forms of LGMD affect both sexes equally. The age of onset varies among the different mutations. It also can vary among families with the same mutation. Reported age of onset of LGMDs is between 1 and 50 years, although some patients may be asymptomatic. Myofibrillar myopathies can present in the first decade of life up until the 60s or 70s. Thompson R, Straub V. Limb-girdle muscular dystrophies - international collaborations for translational research. Nat Rev Neurol. 2016 May. 12 (5):294-309. [Medline]. Moore SA, Shilling CJ, Westra S, Wall C, Wicklund MP, Stolle C, et al. Limb-girdle muscular dystrophy in the United States. J Neuropathol Exp Neurol. 2006 Oct. 65(10):995-1003. [Medline]. van der Kooi AJ, Frankhuizen WS, Barth PG, Howeler CJ, Padberg GW, Spaans F, et al. Limb-girdle muscular dystrophy in the Netherlands: gene defect identified in half the families. Neurology. 2007 Jun 12. 68(24):2125-8. [Medline]. Lo HP, Cooper ST, Evesson FJ, Seto JT, Chiotis M, Tay V, et al. Limb-girdle muscular dystrophy: diagnostic evaluation, frequency and clues to pathogenesis. Neuromuscul Disord. 2008 Jan. 18(1):34-44. [Medline]. Guglieri M, Magri F, D'Angelo MG, Prelle A, Morandi L, Rodolico C, et al. Clinical, molecular, and protein correlations in a large sample of genetically diagnosed Italian limb girdle muscular dystrophy patients. Hum Mutat. 2008 Feb. 29(2):258-66. [Medline]. Fanin M, Nascimbeni AC, Aurino S, Tasca E, Pegoraro E, Nigro V, et al. Frequency of LGMD gene mutations in Italian patients with distinct clinical phenotypes. Neurology. 2009 Apr 21. 72(16):1432-5. [Medline]. Groen EJ, Charlton R, Barresi R, Anderson LV, Eagle M, Hudson J, et al. Analysis of the UK diagnostic strategy for limb girdle muscular dystrophy 2A. Brain. 2007 Dec. 130:3237-49. [Medline]. Nguyen K, Bassez G, Krahn M, Bernard R, Laforêt P, Labelle V, et al. Phenotypic study in 40 patients with dysferlin gene mutations: high frequency of atypical phenotypes. Arch Neurol. 2007 Aug. 64(8):1176-82. [Medline]. Vilchez JJ, Gallano P, Gallardo E, Lasa A, Rojas-García R, Freixas A. Identification of a novel founder mutation in the DYSF gene causing clinical variability in the Spanish population. Arch Neurol. 2005 Aug. 62(8):1256-9. [Medline]. Seror P, Krahn M, Laforet P, Leturcq F, Maisonobe T. Complete fatty degeneration of lumbar erector spinae muscles caused by a primary dysferlinopathy. Muscle Nerve. 2008 Mar. 37(3):410-4. [Medline]. Klinge L, Aboumousa A, Eagle M, Hudson J, Sarkozy A, Vita G. New aspects on patients affected by dysferlin deficient muscular dystrophy. J Neurol Neurosurg Psychiatry. 2010 Sep. 81(9):946-53. [Medline]. Ferreiro A, Mezmezian M, Olivé M, Herlicoviez D, Fardeau M, Richard P. Telethonin-deficiency initially presenting as a congenital muscular dystrophy. Neuromuscul Disord. 2011 Jun. 21(6):433-8. [Medline]. Olivé M, Shatunov A, Gonzalez L, Carmona O, Moreno D, Quereda LG, et al. Transcription-terminating mutation in telethonin causing autosomal recessive muscular dystrophy type 2G in a European patient. Neuromuscul Disord. 2008 Dec. 18(12):929-33. [Medline]. Saccone V, Palmieri M, Passamano L, Piluso G, Meroni G, Politano L, et al. Mutations that impair interaction properties of TRIM32 associated with limb-girdle muscular dystrophy 2H. Hum Mutat. 2008 Feb. 29(2):240-7. [Medline]. Palmieri A, Manara R, Bello L, Mento G, Lazzarini L, Borsato C. Cognitive profile and MRI findings in limb-girdle muscular dystrophy 2I. J Neurol. 2011 Jul. 258(7):1312-20. [Medline]. Sveen ML, Schwartz M, Vissing J. High prevalence and phenotype-genotype correlations of limb girdle muscular dystrophy type 2I in Denmark. Ann Neurol. 2006 May. 59(5):808-15. [Medline]. Stensland E, Lindal S, Jonsrud C, Torbergsen T, Bindoff LA, Rasmussen M, et al. Prevalence, mutation spectrum and phenotypic variability in Norwegian patients with Limb Girdle Muscular Dystrophy 2I. Neuromuscul Disord. 2011 Jan. 21(1):41-6. [Medline]. Mathews KD, Stephan CM, Laubenthal K, Winder TL, Michele DE, Moore SA, et al. Myoglobinuria and muscle pain are common in patients with limb-girdle muscular dystrophy 2I. Neurology. 2011 Jan 11. 76(2):194-5. [Medline]. [Full Text]. Hanisch F, Grimm D, Zierz S, Deschauer M. Frequency of the FKRP mutation c.826C>A in isolated hyperCKemia and in limb girdle muscular dystrophy type 2 in German patients. J Neurol. 2010 Feb. 257(2):300-1. [Medline]. Wahbi K, Meune C, Hamouda el H, Stojkovic T, Laforêt P, Bécane HM, et al. Cardiac assessment of limb-girdle muscular dystrophy 2I patients: an echography, Holter ECG and magnetic resonance imaging study. Neuromuscul Disord. 2008 Aug. 18(8):650-5. [Medline]. Pénisson-Besnier I, Hackman P, Suominen T, Sarparanta J, Huovinen S, Richard-Crémieux I, et al. Myopathies caused by homozygous titin mutations: limb-girdle muscular dystrophy 2J and variations of phenotype. J Neurol Neurosurg Psychiatry. 2010 Nov. 81(11):1200-2. [Medline]. Jarry J, Rioux MF, Bolduc V, Robitaille Y, Khoury V, Thiffault I, et al. A novel autosomal recessive limb-girdle muscular dystrophy with quadriceps atrophy maps to 11p13-p12. Brain. 2007 Feb. 130:368-80. [Medline]. Bolduc V, Marlow G, Boycott KM, Saleki K, Inoue H, Kroon J, et al. Recessive mutations in the putative calcium-activated chloride channel Anoctamin 5 cause proximal LGMD2L and distal MMD3 muscular dystrophies. Am J Hum Genet. 2010 Feb 12. 86(2):213-21. [Medline]. [Full Text]. Hicks D, Sarkozy A, Muelas N, Koehler K, Huebner A, Hudson G, et al. A founder mutation in Anoctamin 5 is a major cause of limb-girdle muscular dystrophy. Brain. 2011 Jan. 134:171-82. [Medline]. Godfrey C, Escolar D, Brockington M, Clement EM, Mein R, Jimenez-Mallebrera C, et al. Fukutin gene mutations in steroid-responsive limb girdle muscular dystrophy. Ann Neurol. 2006 Nov. 60(5):603-10. [Medline]. Puckett RL, Moore SA, Winder TL, Willer T, Romansky SG, Covault KK, et al. Further evidence of Fukutin mutations as a cause of childhood onset limb-girdle muscular dystrophy without mental retardation. Neuromuscul Disord. 2009 May. 19(5):352-6. [Medline]. [Full Text]. Vuillaumier-Barrot S, Quijano-Roy S, Bouchet-Seraphin C, Maugenre S, Peudenier S, Van den Bergh P. Four Caucasian patients with mutations in the fukutin gene and variable clinical phenotype. Neuromuscul Disord. 2009 Mar. 19(3):182-8. [Medline]. Murakami T, Hayashi YK, Ogawa M, Noguchi S, Campbell KP, Togawa M, et al. A novel POMT2 mutation causes mild congenital muscular dystrophy with normal brain MRI. Brain Dev. 2009 Jun. 31(6):465-8. [Medline]. [Full Text]. Biancheri R, Falace A, Tessa A, Pedemonte M, Scapolan S, Cassandrini D, et al. POMT2 gene mutation in limb-girdle muscular dystrophy with inflammatory changes. Biochem Biophys Res Commun. 2007 Nov 30. 363(4):1033-7. [Medline]. Hara Y, Balci-Hayta B, Yoshida-Moriguchi T, Kanagawa M, Beltrán-Valero de Bernabé D, Gündesli H. A dystroglycan mutation associated with limb-girdle muscular dystrophy. N Engl J Med. 2011 Mar 10. 364(10):939-46. [Medline]. Gundesli H, Talim B, Korkusuz P, Balci-Hayta B, Cirak S, Akarsu NA. Mutation in exon 1f of PLEC, leading to disruption of plectin isoform 1f, causes autosomal-recessive limb-girdle muscular dystrophy. Am J Hum Genet. 2010 Dec 10. 87(6):834-41. [Medline]. Cetin N, Balci-Hayta B, Gundesli H, Korkusuz P, Purali N, Talim B. A novel desmin mutation leading to autosomal recessive limb-girdle muscular dystrophy: distinct histopathological outcomes compared with desminopathies. J Med Genet. 2013 Jul. 50(7):437-43. [Medline]. Bögershausen N, Shahrzad N, Chong JX, von Kleist-Retzow JC, Stanga D, Li Y. Recessive TRAPPC11 mutations cause a disease spectrum of limb girdle muscular dystrophy and myopathy with movement disorder and intellectual disability. Am J Hum Genet. 2013 Jul 11. 93(1):181-90. [Medline]. Carss KJ, Stevens E, Foley AR, et al. Mutations in GDP-mannose pyrophosphorylase B cause congenital and limb-girdle muscular dystrophies associated with hypoglycosylation of α-dystroglycan. Am J Hum Genet. 2013 Jul 11. 93 (1):29-41. [Medline]. Cabrera-Serrano M, Ghaoui R, Ravenscroft G, Johnsen RD, Davis MR, Corbett A, et al. Expanding the phenotype of GMPPB mutations. Brain. 2015 Apr. 138 (Pt 4):836-44. [Medline]. Cirak S, Foley AR, Herrmann R, et al. ISPD gene mutations are a common cause of congenital and limb-girdle muscular dystrophies. Brain. 2013 Jan. 136 (Pt 1):269-81. [Medline]. Tasca G, Moro F, Aiello C, Cassandrini D, Fiorillo C, Bertini E, et al. Limb-girdle muscular dystrophy with α-dystroglycan deficiency and mutations in the ISPD gene. Neurology. 2013 Mar 5. 80 (10):963-5. [Medline]. Chardon JW, Smith AC, Woulfe J, Pena E, Rakhra K, Dennie C, et al. LIMS2 mutations are associated with a novel muscular dystrophy, severe cardiomyopathy and triangular tongues. Clin Genet. 2015 Dec. 88 (6):558-64. [Medline]. Schindler RF, Scotton C, Zhang J, et al. POPDC1(S201F) causes muscular dystrophy and arrhythmia by affecting protein trafficking. J Clin Invest. 2016 Jan. 126 (1):239-53. [Medline]. Aboumousa A, Hoogendijk J, Charlton R, Barresi R, Herrmann R, Voit T, et al. Caveolinopathy--new mutations and additional symptoms. Neuromuscul Disord. 2008 Jul. 18(7):572-8. [Medline]. Greenberg SA, Salajegheh M, Judge DP, Feldman MW, Kuncl RW, Waldon Z. Etiology of limb girdle muscular dystrophy 1D/1E determined by laser capture microdissection proteomics. Ann Neurol. 2012 Jan. 71(1):141-5. [Medline]. Sarparanta J, Jonson PH, Golzio C, Sandell S, Luque H, Screen M. Mutations affecting the cytoplasmic functions of the co-chaperone DNAJB6 cause limb-girdle muscular dystrophy. Nat Genet. 2012 Apr. 44(4):450-5, S1-2. [Medline]. Harms MB, Sommerville RB, Allred P, Bell S, Ma D, Cooper P. Exome sequencing reveals DNAJB6 mutations in dominantly-inherited myopathy. Ann Neurol. 2012 Mar. 71(3):407-16. [Medline]. Palenzuela L, Andreu AL, Gamez J, et al. A novel autosomal dominant limb-girdle muscular dystrophy (LGMD 1F) maps to 7q32.1-32.2. Neurology. 2003 Aug 12. 61(3):404-6. [Medline]. Vieira NM, Naslavsky MS, Licinio L, Kok F, Schlesinger D, Vainzof M, et al. A defect in the RNA-processing protein HNRPDL causes limb-girdle muscular dystrophy 1G (LGMD1G). Hum Mol Genet. 2014 Aug 1. 23 (15):4103-10. [Medline]. Fischer D, Kley RA, Strach K, Meyer C, Sommer T, Eger K, et al. Distinct muscle imaging patterns in myofibrillar myopathies. Neurology. 2008 Sep 2. 71(10):758-65. [Medline]. Selcen D, Muntoni F, Burton BK, Pegoraro E, Sewry C, Bite AV, et al. Mutation in BAG3 causes severe dominant childhood muscular dystrophy. Ann Neurol. 2009 Jan. 65(1):83-9. [Medline]. [Full Text]. Odgerel Z, Sarkozy A, Lee HS, McKenna C, Rankin J, Straub V. Inheritance patterns and phenotypic features of myofibrillar myopathy associated with a BAG3 mutation. Neuromuscul Disord. 2010 Jul. 20(7):438-42. [Medline]. Beckmann JS, Spencer M. Calpain 3, the "gatekeeper" of proper sarcomere assembly, turnover and maintenance. Neuromuscul Disord. 2008 Dec. 18(12):913-21. [Medline]. Cacciottolo M, Numitone G, Aurino S, Caserta IR, Fanin M, Politano L, et al. Muscular dystrophy with marked Dysferlin deficiency is consistently caused by primary dysferlin gene mutations. Eur J Hum Genet. 2011 Sep. 19(9):974-80. [Medline]. [Full Text]. Markert CD, Ning J, Staley JT, Heinzke L, Childers CK, Ferreira JA, et al. TCAP knockdown by RNA interference inhibits myoblast differentiation in cultured skeletal muscle cells. Neuromuscul Disord. 2008 May. 18(5):413-22. [Medline]. Lommel M, Cirak S, Willer T, Hermann R, Uyanik G, van Bokhoven H. Correlation of enzyme activity and clinical phenotype in POMT1-associated dystroglycanopathies. Neurology. 2010 Jan 12. 74(2):157-64. [Medline]. Torella A, Fanin M, Mutarelli M, Peterle E, Del Vecchio Blanco F, Rispoli R. Next-generation sequencing identifies transportin 3 as the causative gene for LGMD1F. PLoS One. 2013. 8(5):e63536. [Medline]. Ferrer I, Olivé M. Molecular pathology of myofibrillar myopathies. Expert Rev Mol Med. 2008 Sep 3. 10:e25. [Medline]. Hughes S. Guideline to Aid Muscular Dystrophy Diagnosis, Management. Medscape Medical News. Available at http://www.medscape.com/viewarticle/833400. Accessed: October 19, 2014. Naravanaswami P., et al. . Evidence-based guideline summary: Diagnosis and treatment of limb-girdle and distal dystrophies: Report of the Guideline Development Subcommittee of the American Academy of Neurology and the Practice Issues Review Panel of the American Association of Neuromuscular & Electrodiagnostic Medicine. Neurology. 2014 Oct. 14;83(16):1453-63. [Full Text]. Ghaoui R, Cooper ST, Lek M, Jones K, Corbett A, Reddel SW, et al. Use of Whole-Exome Sequencing for Diagnosis of Limb-Girdle Muscular Dystrophy: Outcomes and Lessons Learned. JAMA Neurol. 2015 Dec. 72 (12):1424-32. [Medline]. Paradas C, Llauger J, Diaz-Manera J, Rojas-García R, De Luna N, Iturriaga C. Redefining dysferlinopathy phenotypes based on clinical findings and muscle imaging studies. Neurology. 2010 Jul 27. 75(4):316-23. [Medline]. Trabelsi M, Kavian N, Daoud F, Commere V, Deburgrave N, Beugnet C, et al. Revised spectrum of mutations in sarcoglycanopathies. Eur J Hum Genet. 2008 Jul. 16(7):793-803. [Medline]. Mendell JR, Rodino-Klapac LR, Rosales XQ, Coley BD, Galloway G, Lewis S, et al. Sustained alpha-sarcoglycan gene expression after gene transfer in limb-girdle muscular dystrophy, type 2D. Ann Neurol. 2010 Nov. 68(5):629-38. [Medline]. [Full Text]. Wagner KR, Fleckenstein JL, Amato AA, et al. A phase I/IItrial of MYO-029 in adult subjects with muscular dystrophy. Ann Neurol. 2008 May. 63 (5):561-71. [Medline]. Narayanaswami P, Weiss M, Selcen D, David W, Raynor E, et al. Evidence-based guideline summary: diagnosis and treatment of limb-girdle and distal dystrophies: report of the guideline development subcommittee of the American Academy of Neurology and the practice issues review panel of the American Association of Neuromuscular & Electrodiagnostic Medicine. Neurology. 2014 Oct 14. 83 (16):1453-63. [Medline]. Balci B, Uyanik G, Dincer P, et al. An autosomal recessive limb girdle muscular dystrophy (LGMD2) with mild mental retardation is allelic to Walker-Warburg syndrome (WWS) caused by a mutation in the POMT1 gene. Neuromuscul Disord. 2005 Apr. 15(4):271-5. [Medline]. Bar H. Mucke N. Ringler P. Muller SA. Kreplak L. Katus HA. Aebi U. Herrmann H. Impact of disease mutations on the desmin filament assembly process. J Molec Biol. Jul 2006. 360:1031-42. [Medline]. Boito CA, Melacini P, Vianello A, et al. Clinical and molecular characterization of patients with limb-girdle muscular dystrophy type 2I. Arch Neurol. 2005. 62:1894-9. [Medline]. Bönnemann CG, Bushby K. The limb-girdle muscular dystrophies. Engel AG, Franzini-Armstrong C. Myology. 3rd ed. New York, NY: McGraw Hill; 2004. 1077-1121. Clement EM, Godfrey C, Tan J, Brockington M, Torelli S, Feng L. Mild POMGnT1 mutations underlie a novel limb-girdle muscular dystrophy variant. Arch Neurol. 2008 Jan. 65(1):137-41. [Medline]. D'Amico A, Tessa A, Bruno C. Expanding the clinical spectrum of POMT1 phenotype. Neurology. 2006. 66:1564-7. [Medline]. D'Amico A. Benedetti S. Petrini S. Sambuughin N. Boldrini R. Menditto I. Ferrari M. Verardo M. Goldfarb L. Bertini E. Major myofibrillar changes in early onset myopathy due to de novo heterozygous missense mutation in lamin A/C gene. 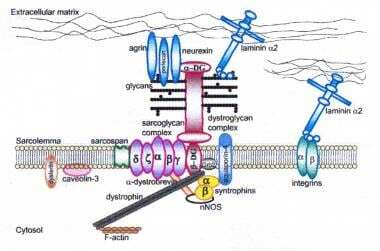 Neuromuscular Disorders. Dec 2005. 15:847-50. [Medline]. Fanin M, Nascimbeni AC, Angelini C. Screening of calpain-3 autolytic activity in LGMD muscle: a functional map of CAPN3 gene mutations. J Med Genet. 2007. 44:38-43. [Medline]. Fischer D, Walter MC, Kesper K. Diagnostic value of muscle MRI in differentiating LGMD2I from other LGMDs. J Neurol. 2005. 252:538-47. [Medline]. Fulizio L, Nascimbeni AC, Fanin M, et al. Molecular and muscle pathology in a series of caveolinopathy patients. Hum Mutat. 2005 Jan. 25(1):82-9. [Medline]. Goudeau B. Rodrigues-Lima F. Fischer D. Casteras-Simon M. Sambuughin N. de Visser M. Laforet P. Ferrer X. Chapon F. Sjoberg G. Kostareva A. Sejersen T. Dalakas MC. Goldfarb LG. Vicart P. Variable pathogenic potentials of mutations located in the desmin alpha-helical domain. Human Mutation. Sep 2006. 27:906-13. [Medline]. Guglieri M, Magri F, Comi GP. Molecular etiopathogenesis of limb girdle muscular and congenital muscular dystrophies: boundaries and contiguities. Clinica Chimica Acta. 2005. 361:54-79. [Medline]. Kramerova I, Beckmann JS, Spencer MJ. Molecular and cellular basis of calpainopathy (limb girdle muscular dystrophy type 2A). Biochim Biophys Acta. 2007 Feb. 1772(2):128-44. [Medline]. Neuromuscular Disease Center. Dilated cardiomyopathy. St Louis, Mo: Washington University. Available at https://neuromuscular.wustl.edu/. Accessed: January 12, 2006. Neuromuscular Disease Center. Large or prominent muscles. Familial partial lipodystrophy (Kobberling-Dunnigan syndrome). St Louis, Mo: Washington University. Available at https://neuromuscular.wustl.edu/. Accessed: September 19, 2005. Olive M, Goldfarb LG, Shatunov A, et al. Myotilinopathy: refining the clinical and myopathological phenotype. Brain. 2005 Oct. 128(Pt 10):2315-26. [Medline]. Ozawa E, Mizuno Y, Hagiwara Y. Molecular and cell biology of the sarcoglycan complex. Muscle Nerve. 2005. 32:563-76. [Medline]. Penisson-Besnier I. Talvinen K. Dumez C. Vihola A. Dubas F. Fardeau M. Hackman P. Carpen O. Udd B. Myotilinopathy in a family with late onset myopathy. Neuromuscular Disorders. July 2006. 16:427-31. [Medline]. Pestronk A. Neuromuscular Disease Center. St Louis, Mo: Washington University. Available at http://www.neuro.wustl.edu/neuromuscular. Raju R. Dalakas MC. Absence of upregulated genes associated with protein accumulations in desmin myopathy. Muscle Nerve. Mar 2007. 35:386-8. [Medline]. Saenz A, Leturcq F, Cobo AM, et al. LGMD2A: genotype-phenotype correlations based on a large mutational survey on the calpain 3 gene. Brain. 2005 Apr. 128(Pt 4):732-42. [Medline]. Schoser BG, Frosk P, Engel AG. Commonality of TRIM32 mutation in causing sarcotubular myopathy and LGMD2H. Ann Neurol. 2005. 57:591-595. [Medline]. Selcen D, Engel AG. Mutations in myotilin cause myofibrillar myopathy. Neurology. 2004 Apr 27. 62(8):1363-71. [Medline]. Selcen D, Engel AG. Mutations in ZASP define a novel form of muscular dystrophy in humans. Ann Neurol. 2005 Feb. 57(2):269-76. [Medline]. Selcen D, Engel AG. Myofibrillar myopathies. Engel AG, Franzini-Armstrong C, eds. Myology. 3rd ed. New York, NY: McGraw Hill; 2004. 1187-202. Starling A, Kok F, Passos-Bueno MR, et al. A new form of autosomal dominant limb-girdle muscular dystrophy (LGMD1G) with progressive fingers and toes flexion limitation maps to chromosome 4p21. Eur J Hum Genet. 2004 Dec. 12(12):1033-40. [Medline]. Vorgerd M. van der Ven PF. Bruchertseifer V. Lowe T. Kley RA. Schroder R. Lochmuller H. Himmel M. Koehler K. Furst DO. Huebner A. A mutation in the dimerization domain of filamin c causes a novel type of autosomal dominant myofibrillar myopathy. Am J Hum Genet. Aug 2005. 77:297-304. [Medline]. Top: Photomicrograph shows normal alpha-sarcoglycan staining of a myopathic biopsy specimen. Note dark staining around the rims of the muscle fibers. Bottom: Alpha-sarcoglycan stain of a muscle biopsy specimen from a patient with alpha-sarcoglycan deficiency. Note the absence of staining at the rims of the muscle fibers. Patterns of staining similar to these are observed in all the sarcoglycanopathies, dysferlinopathy, calpainopathy and limb-girdle muscular dystrophy type 2I (LGMD2I, Fukutin-related proteinopathy). However, staining may be variably reduced or absent. Gomori trichrome–stained section in patient with myofibrillar myopathy. Note the abnormal accumulations of blue-red material in several muscle fibers. Immunohistochemical staining by using an anti-desmin antibody in a patient with a myofibrillar myopathy. Courtesy of Alan Pestronk.